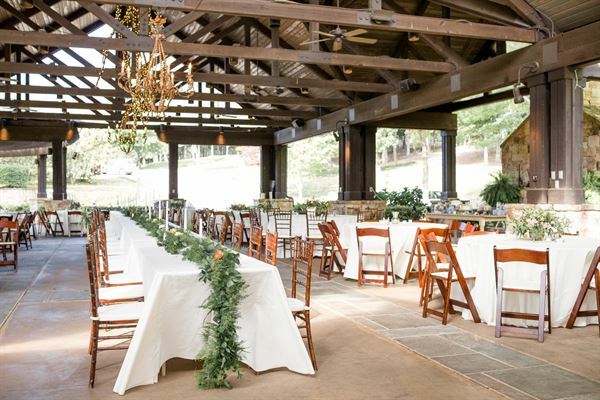 Moore's Mill Club is the perfect place to host your next event! With multiple venues, our club is equipped to host an assortment of events such as, wedding ceremonies and receptions, birthday and anniversary parties, bridal and baby showers, luncheons, rehearsal dinners, company gatherings, and more! With a full-service dining facility, our staff can help you create your ideal event. Our Event Coordinator will help to ease the stresses of event planning. For more information on hosting a private event at Moore’s Mill Club, please contact us! Just steps away from the Pavilion, The Lawn is ideal for wedding ceremonies. The Lawn sits overlooking our beautiful 18th hole and is surrounded with blossoming Crape Myrtles. The Pavilion is our largest event space, and extends to a patio and The Lawn. This space sits adjacent to the Clubhouse and the 18th hole. Enclosed in the winter with clear, wooden panel-siding, which is removed during the Spring and Summer months. Located on the top floor of the Clubhouse, our Fairway Room is a private room, perfect for special events or business functions. Our Grill Room is adjacent to the main dining room, and can be closed off to create an intimate atmosphere.